The numbers this fall aren't good. After a high above 14,000 last year, the Dow is now thrashing around well below 9,000. The U.S. government is spending over $700 billion to buy unprecedented stakes in the nation's largest banks. Many industries, including technology, are hemorrhaging jobs. This post isn't about all that. It's about the silver lining -- the fact that, just as we saw eight years ago when the first Internet bubble burst, financial pressure is now forcing companies to make changes. And just like last time, these changes are laying the foundation for a new, more efficient period of Internet growth. 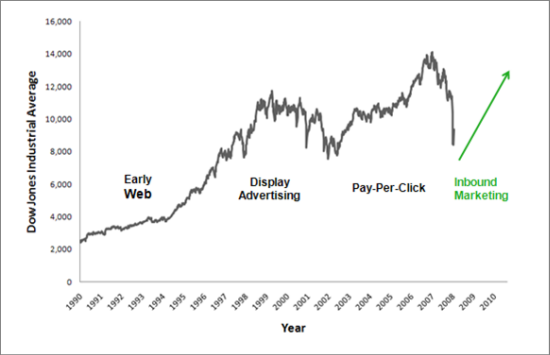 In 2001, when the last downturn began, businesses began shifting some of their marketing dollars to search engine advertising. It was more measurable and targeted than display advertising, so it was appealing to marketers with tight budgets. As we enter a second Internet downturn, businesses are again seeking efficiency. They're shifting money out of paid search advertising, and into optimization, content, and social media that help them get found in organic search results. These changes are laying the foundation for a new era of marketing on the web - the Inbound Marketing era. In traditional marketing (outbound marketing), companies focus on finding customers. They use techniques that are poorly targeted and that interrupt people. They use cold-calling, print advertising, T.V. advertising, junk mail, spam, and trade shows. Technology is making these techniques less effective and more expensive. Caller ID blocks cold calls, TiVo makes T.V. advertising less effective, spam filters block mass emails, and tools like RSS are making print and display advertising less effective. It's still possible to get a message out via these channels, but it costs more. Instead of interrupting people with television ads, they create videos that potential customers want to see. Instead of buying display ads in print publications, they create their own business blog that people subscribe to and look forward to reading. Instead of cold calling, they create useful content and tools so that prospects contact them looking for more information. Instead of driving their message into a crowd over and over again like a sledgehammer, they attract highly qualified customers to their business like a magnet. (1) Content - Content creation is the core of any Inbound Marketing campaign. It is the information or tool that attracts potential customers to your site or your business. (2) Search Engine Optimization - Search engine optimization makes it easier for potential customers to find your content. It is the practice of building your site and inbound links to your site to maximize your ranking in search engines, where most of your customers begin their buying process. (3) Social Media - Social media amplifies the impact of your content. When your content is distributed across and discussed on networks of personal relationships, it becomes more authentic and nuanced, and is more likely to draw qualified customers to your site. 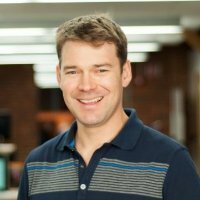 As the economy slows down, companies are turning to Inbound Marketing because it is a more efficient way of allocating marketing resources than traditional, outbound marketing. As our CEO, Brian Halligan, puts it, when you're inbound marketing, the thickness of your brain matters a lot more than the thickness of your wallet. (1) It Costs Less - Outbound marketing means spending money - either by buying ads, buying email lists or renting huge booths at trade shows. 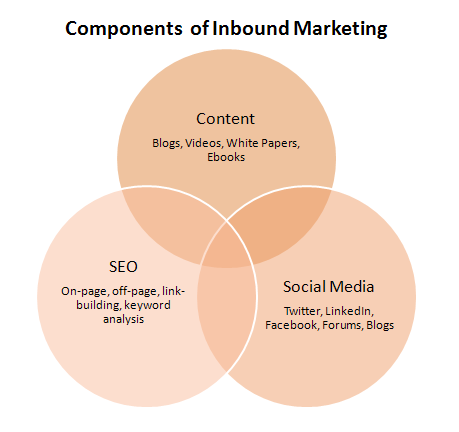 Inbound Marketing means creating content and talking about it. A blog costs nothing to start. A Twitter account is free, too. Both can draw thousands of customers to your site. 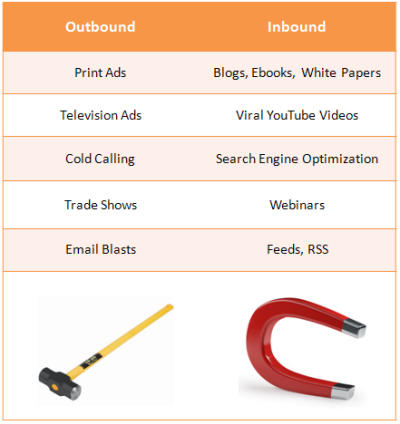 The marketing ROI from inbound campaigns is higher. (2) Better Targeting - Techniques like cold-calling, mass mail, and email campaigns are notoriously poorly targeted. You're reaching out to individuals because of one or two attributes in a database. When you do Inbound Marketing, you only approach people who self-qualify themselves. They demonstrate an interest in your content, so they are likely to be interested in your product. (3) It's an Investment, Not an Ongoing Expense - When you buy pay-per-click advertising on search engines, its value is gone as soon as you pay for it. In order to maintain a position at the top of Google's paid results, you have to keep paying. However, if you invest your resources in creating quality content that ranks in Google's organic results, you'll be there until somebody displaces you. 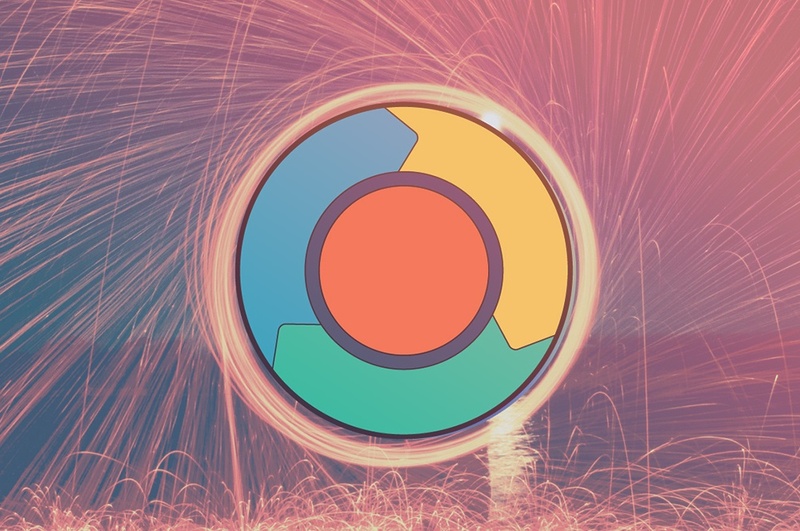 Only in the past year and a half have the technology, the tools and the public's use of both evolved to the point where Inbound Marketing is practical. In the early days of the Internet, there was no mainstream marketing. There were lots of experiments but few business buyers and consumers. In the mid-1990s, as the first Internet bubble grew, companies began to follow their customers online. Tools for independent publishing were weak, so companies' online presence mirrored their offline presence. They sprayed advertising across mass media sites and prayed a few potential customers would see it. When the dot-com bubble popped in 2001, marketers began to reassess the effectiveness of the spray-and-pray approach. They saw that consumers and business buyers were starting their purchase process less on mass media sites, and more on search engines. They discovered that in many cases targeted search engine advertising was far more effective than display advertising on large media sites. 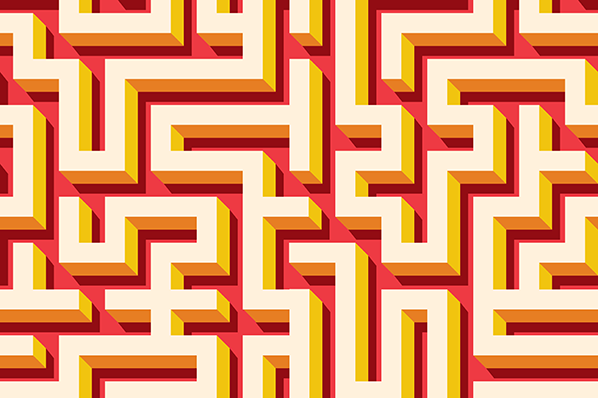 As spending poured into search marketing, a new era of Internet growth began. In addition to changes in Internet marketing, this phase of growth -- Web 2.0 -- produced significant changes in the way we use the web. It shifted from a read-only platform to one where anybody could publish, connect with friends, and share content. Now, as we enter a new economic downturn, online marketers are using the tools of this new read-write web to become more efficient. They're using social media, they're publishing content, and they're optimizing it. They're becoming Inbound Marketers. Eight years ago, when the dot-com bubble collapsed, the idea of a single man using great content, social media, and search engine optimization to build a New Jersey liquor store into a $50-million-a-year business in the course of two years would have been absurd. Yet that's exactly what Gary Vaynerchuk has done since he launched Wine Library TV in 2006. This is the power of Inbound Marketing. With the tools that have become mainstream over the last two to three years, the scale of any business can be unlimited. If you have a great product and the skills to communicate with your customers, you can compete with the biggest advertising budgets. For an even deeper understanding of inbound marketing, check out HubSpot's free marketing certification program. Get started here.